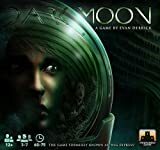 Let's be frank: there are many opportunities to cheat in Dark Moon. Players can easily change the face of a die when submitting it, roll more dice than they should for certain actions, or even have more dice than their die limit allows. Unfortunately, due to the secretive nature of the game, there is really no way to verify that a player rolled what they said they rolled. The only solution we have for this problem is: don't play with cheaters. They're not much fun anyways. Unless otherwise stated, these rules apply to all dice rolls. Dice rolls are always private, and a player may never reveal what they rolled to another player. The only dice that are seen publicly are the ones that a player chooses to submit. This applies to Infected players as well. The number of active dice a player has behind their screen as well as what kinds of dice (either Strong or Weak) is also private. Players may share this information with others, but they may also lie about what they have. 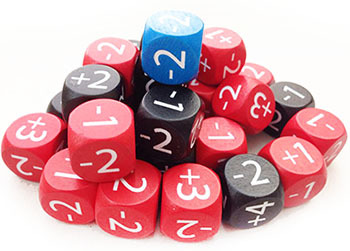 If a player chooses to roll their dice, they must roll all the active dice available to them (unless the action calls for a specific number of dice, i.e. "Roll up to three dice and submit one"). This applies to Infected players as well. After an action or Task has been resolved, any dice that were submitted are moved from the Spent Resources pool to the Available Resources pool. if a revealed Infected player succeeds at the ENERGY SPIKE action. In each instance, place all Shield tokens on the board in the next 15 available spots on the Shield track before rolling the die. If the roll matches the current Failure Condition on the Shield track, the active player chooses whether to draw an Outpost token or a Fatigue token. If, for whatever reason, a player's die limit is reduced and they have more active dice behind their screen than their new die limit allows, they must immediately discard any excess dice to the Available Resources pool (their choice). If the Commander role changes to another player, the previous Commander immediately places the Commander die on the Available Resources pool. 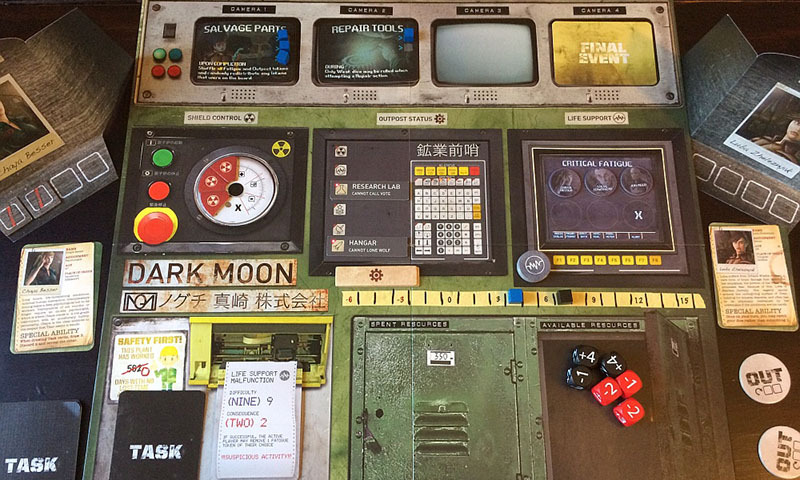 When a player's die limit is increased, however, they do NOT immediately retrieve their new dice (including the Commander die if a player has just received the Commander card), k player may only retrieve dice at the beginning of their turn, when passing during a Malfunction Task, when issued an order by another player, or when a completed Event card allows them to. A player is always considered to have a die limit of at least 1. In the rare occurence that a player's die limit is reduced to 0 or less, that player may still retrieve and hold at least one die behind their screen. If the Commander is ever quarantined, the Commander card passes to the player who initiated the vote. However, if the player who initiated the vote is in quarantine themselves (or if the Commander initiated the vote), the role passes to the first Uninfected player to the Commander's left. If the Commander reveals as Infected, the role passes to the first Uninfected player to the Commander's left. If at any point in the game all Infected players have revealed themselves, remove the Suspicion cube from the game and ignore ''SUSPICIOUS ACTIVITY!!!" on Task cards. Some Event cards and Complication Task cards will feel strange, anti- climactic, or heavily weighted in the Uninfected team's favor if all Infected have revealed. This usually hurts the Infected team and is a consequence for being discovered too early or revealing too soon.